Ah, I see what you mean now. Thanks for the clarification! As to the original 705 that I needed to replace, there was very obvious harmonic distortion coming from the mid-bass driver that would stop if you touched it. See attached jpgs for the good right and bad left 705s. Polk replaced the driver, but the distortion was still there. Polk decided that it was likely a leak in the mid-bass driver compartment that spoiled the acoustic suspension loading of the driver, hence allowing it to move outside of its linear range. Polk chose to replace the whole speaker, which I greatly appreciated. Excuse my ignorance, which graph is for which speaker? The top graph is the "bad" left speaker and with a ~250 Hz signal, you can see the harmonics at 500 and 750 Hz are only 20-30 dB down and there is lots of hash at higher frequencies. 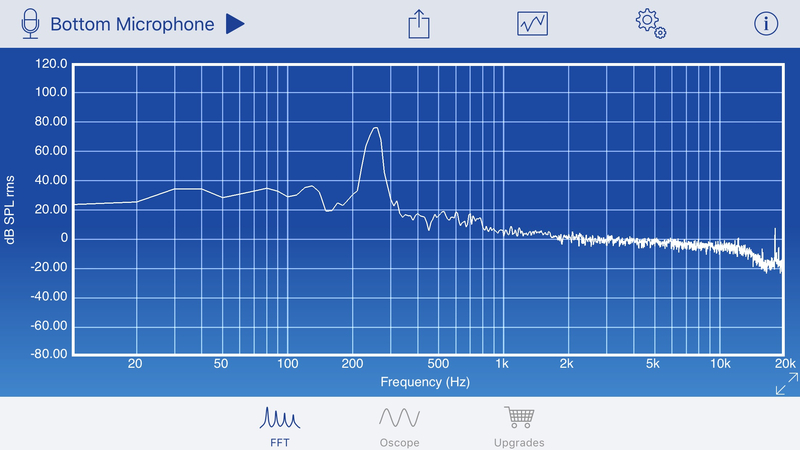 With the "good" right speaker, bottom, you don't see any obvious harmonics. This was all done with my phone and used to show Polk the nature of the distortions. Thanks again for the clarification, I sincerely appreciate it. What did that distortion sound like when you were playing music? Was it obvious? The answer to your last question is, yes and no. With music, it depends and only happened when there was fairly strong content in the mid-bass frequency range. Also, this type of harmonic distortion is often done on purpose, e.g. “fuzz” with electric guitars, and in the colloquial, sort of sounds like farting. When I first heard it watching TV, I wasn’t sure whether it was part of the soundtrack, e.g intentional fuzz, or a problem with the speaker. However, I was hearing it more than I thought I should, so checked with a frequency sweep, and it was very obvious as distortion when played through the left channel but not the right. The fact that I could stop the distortion by lightly touching the driver’s surround told me that the mid-bass driver was being driven outside its linear range. I snapped an FFT analysis to get some idea as to the magnitude of the distortion, as can be seen above. Great job on recognizing and diagnosing the issue! Now I have to be über diligent when listening for any issues. In my opinion, the mid bass driver (which I have already replaced one in my 705’s) are the weak links of these speakers. Otherwise very stellar. Not sure. They seem to move more than the subwoofers when driven hard. Could be a design flaw in the power distribution between the drivers but I’m not sure. I don’t drive them that hard. Crossover to the cassinis is too low IMHO. That said, they sound spectacular withn the limits. Not saying I don’t love them, I do. But even great products have their flaws. You will not regret buying them. While they are not SPL monsters, you don't need to baby them. I have never bottomed out the mid-woof. That said, when running them full range, the 5 1/4 driver really moves. Play Pink Floyd, Mother & crank it up some. You'll see what I mean. Performed this "test" with no major cone movement visible. This is probably because I live in an apartment & the "loudest" listening levels I get to here aren't very loud (perhaps by forum standards?). lol. The 705s certainly play loud enough for my purposes, and I live in a large house some distance from the neighbors with a dedicated home theater. Let's see if my signature block now has info. Tried several times, but no luck. Nice reviews...considering getting a pair of 705's myself. It is true, but the amplifier in question is still in rehab. We wanted it to go to rehab, and we said, yes, yes, yes. Hey Vic just caught this. Yes it is! I've got it paired with the VTL pre and SRS's with new tweeters. Still breaking em in, but so far sounds fantastic! Was playing the new Bill Idol album rather loud last night and the CJ didn't break a sweat! Just out of curiosity...why did you sell them? They were not a good fit for the rest of my setup. I preferred the sound of the Signature S60 speakers > that of the LSiM 705 speakers in my listening environment & on my gear. I have since sold the Signature S60 speakers and I am now using Usher CP-6311 floorstanding speakers. I hope that helps you. If you have any more questions, don't hesitate to ask. That really is helpful. As a happy S15 owner, I can understand the appreciation for the Sig series. What was the app used to get these graphs? 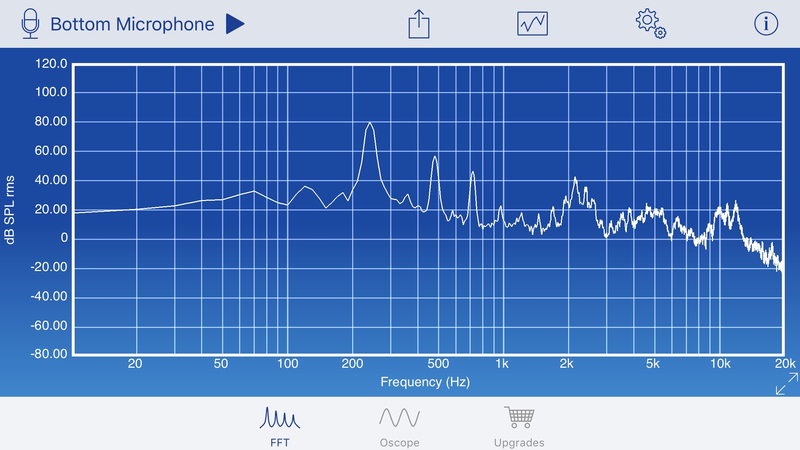 Those graphs were made with SignalScope on my iPhone. That should be fine. I was not using REW at the time and love it now. Before I was using a sweep on a test CD and SignalScope as the RTA. In my case the distortion happened only during a fairly specific frequency range and I would have to pause SignalScope and save the image when I started to see the distortion. I would think that the RTA function of REW would work fine for capturing this sort of thing.